Always be prepared! The Hybrid 3 from our friends at Survive Outdoors Longer has just about everything that you need to cover your bases outdoors – survival, first aid, and gear repair. In this compact kit about the size of a paperback book and weighing a touch over a pound, there are 34 different items, smartly divided into 2 sectioned pouches. Survival items include a 100dB whistle, a 2-Watt LED headlamp, survival blanket, Fire Lite sparker and 20mm compass. 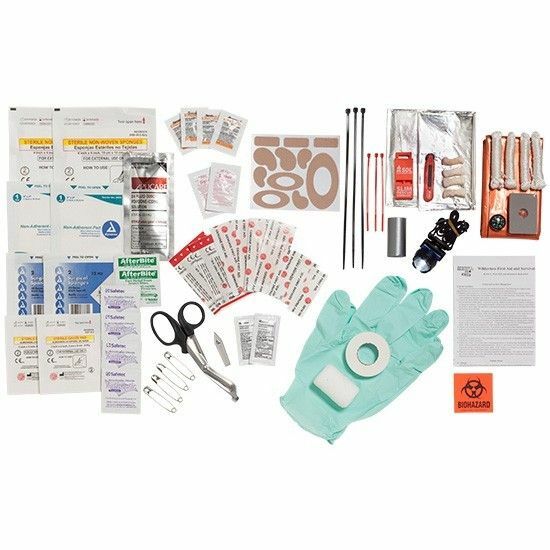 First aid supplies include a wide selection of bandages, dressings, and medicines, and finally the gear repair kit includes 2 different sized cable ties and duct tape. An all-inclusive kit for your next backcountry trek or camping trip. As they say, “expect the unexpected”.